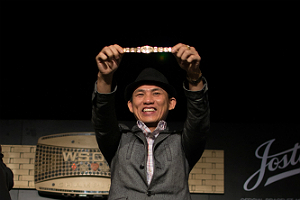 One-time gold bracelet winner Christian Pham from Minnesota ended Day 6 of the 2017 WSOP Main Event as the player to bag and tag the most chips, a total of 31,440,000 to be more precise. Pham will thus lead the 27 remaining survivors into Day 7 of the tournament. Their task will be to narrow the field to the official nine-handed final table, something the poker world has been waiting impatiently for over the past year. If Pham’s live tournament poker career could be described somehow, saying that it has involved a myriad of lucky turns would be one good way of putting it. In 2015, the player entered a $1,500 No-Limit 2-7 Lowball Draw tournament by mistake and eventually topped its 219-person field to claim the gold. This year, he won a seat into the Main Event via a $575 buy-in qualifier and almost got eliminated on Day 5. Pham needed a six to survive a four-straight board with one pair. A six was miraculously delivered to save the player. A day later, he gained momentum big enough to secure him with the chip leader spot. Talking to WSOP staff on Sunday evening, Pham was unable to contain his happiness and excitement, saying that it was a dream come true to make it to the final 27 in the Main Event. Among others, Pham will face fierce competition from former Main Event final table participants Antoine Saout and Ben Lamb. Both players have third-place finishes in the world’s most prestigious No-Limit Hold’em tournament. Saout reached the final table in 2009. His deep run made him $3,479,669 richer. As for Lamb, he locked his third-place finish in 2011, collecting $4,021,138 for his performance. Being so close to the final table this year, both players will certainly strive to repeat their achievements and even exceed them. The 2017 WSOP Main Event final table will be played over three days – from July 20-22. Each of the nine finalists will be secured with a minimum payout of $1 million. However, there is no doubt that they will all be eyeing the $8.15-million first-place payment and the specially crafted World Champion bracelet. Pham will kick off Day 7 play as the chip leader and followed by France’s Valentin Messina with 28,590,000, UK’s Jack Sinclair with 27,535,000, Ben Lamb with 25,685,000, and Portugal’s Pedro Oliveira with 22,540,000. All players that survived thus far into the tournament have locked a minimum payout of $263,532. Day 7 play is scheduled to begin today at 11 am local time and will continue until the field is reduced to just nine players.